I cant seem to get the direct disc printing to work on this printer. I have changed print properties but just wont work. It just keeps printing on paper, if I have a disc in there it just does nothing and the print job sits there. Any help? It sounds like the print driver settings need to be adjusted. 1. Start AudioLabel, open the "Change Label Template" window, and select the "Brother MFC-J870DW Printer" template. 2. 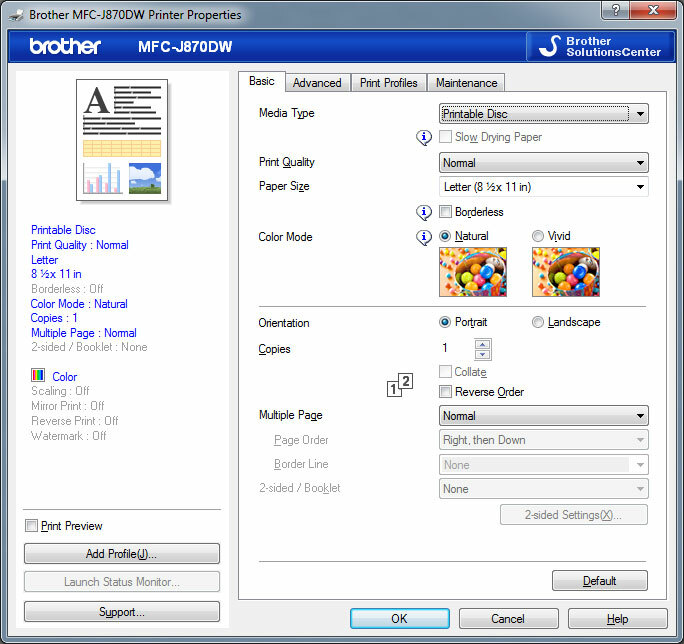 Next, click the "Print" button, and make sure the "Brother MFC-J870DW Printer" is selected in the Printer drop-down. 3. Click the "Printer Properties" button, and then click "Print Driver Properties" button under "Settings for printing directly on the disc". 4. Once the Brother print driver window is open, select "Printable Disc" as then "Media Type" (as show below). Click the OK button and AudioLabel should now print directly on the disc.